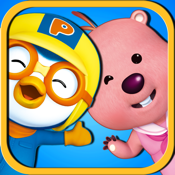 Pororo is finally in Loopy’s home to play with! Let’s cook tasty cookies and kebabs with the help of Loopy’s guide. Help Loopy cook enough hotcakes to share with friends! Try to touch magic jar and play word card games. ∙ Touch, drag and turn! Develop your kids’ sensation and quickness. ∙ High quality opening & ending movies from original TV animation.